Always use a new grommet and valve core when installing the tire pressure warning valve and transmitter. Check that the washer and nut are not damaged, and replace them if necessary. Write down the ID number before installation. Check that there is no oil, water or lubricant around the rim hole, tire pressure warning valve and transmitter, washer and nut. Failing to do so may result in improper installation. Use only a specified tire valve cap. If an unspecified tire valve cap is used, it may seize to the tire pressure warning valve and transmitter. 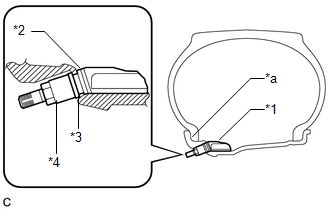 (a) Install a new grommet to the tire pressure warning valve and transmitter. A new tire pressure warning valve and transmitter comes with a grommet installed. Make sure not to install an extra grommet. 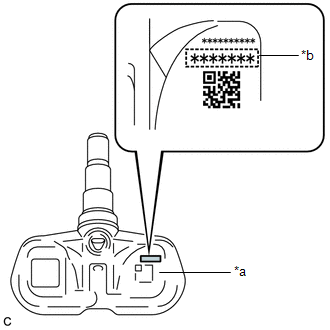 (b) Write down the 7-digit transmitter ID number as shown in the illustration. (c) Insert the tire pressure warning valve and transmitter with grommet from the inside of the rim. Make sure that the tire pressure warning valve and transmitter is installed so that the printed surface can be seen. If the tire pressure warning valve and transmitter is installed upside down, it may be damaged or fail to transmit signals when driving at high speeds. Check that there is no deformation or damage to the tire pressure warning valve and transmitter. Check that there is no foreign matter on the grommet and around the rim hole. (d) From the outside of the rim, install the washer to the tire pressure warning valve and transmitter, and tighten the nut. No further tightening is required once the nut is tightened to the specified torque. Check that there is no foreign matter on the grommet, washer and nut. (e) Set the tire and disc wheel onto the mounting machine as shown in the illustration. 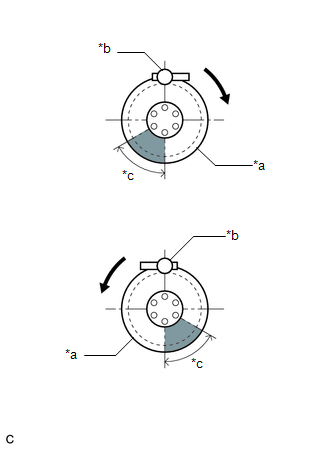 Position the main body of the tire pressure warning valve and transmitter in the area shown in the illustration. If the tire pressure warning valve and transmitter is positioned outside this area, it will interfere with the tire bead and may be damaged. (f) Apply a sufficient coat of soapy water or equivalent to the tire bead and rim. Do not apply soapy water or equivalent directly to the tire pressure warning valve and transmitter. (g) Using a mounting machine, install the tire to the disc wheel. Make sure that the tire bead and mount tool do not interfere with the tire pressure warning valve and transmitter. Make sure that the tire pressure warning valve and transmitter is not clamped by the bead and rim. (h) Install a new valve core. (i) Retighten the nut to the specified torque. (j) Check the surroundings of the tire pressure warning valve and transmitter for air leaks with soapy water or equivalent. (1) If air is leaking from the valve core, press the valve core several times to remove foreign matter. Replace the valve core as necessary. (2) If air is leaking from around the tire pressure warning valve and transmitter, check if the grommet, washer and nut are not deformed, damaged or contaminated with foreign matter. Replace the grommet, washer or nut as necessary. (k) Install the tire valve cap.